Q3 Technologies provided a complete augmented reality solution for maintenance and support of the machine parts. The client is a leading provider of industrial and consumer electronics products. The client has a strong global presence across 50 countries with 7 manufacturing locations in India. The client has highly automated manufacturing units to produce world-class products supported by an extensive distribution network. For Industrial equipment manufacturing companies the landscape has been changing with increased usage and integration of technology. There are often complex steps in a maintenance process and a series of instructions which sometimes becomes difficult for on-field technicians to manage. This has created a new arena for technology to visualize installation and maintenance through 3d animations and augmented reality. Augmented reality holds enormous potential outside of entertainment, with AR/VR poised to change the way we shop, experience, communicate and even conduct business. 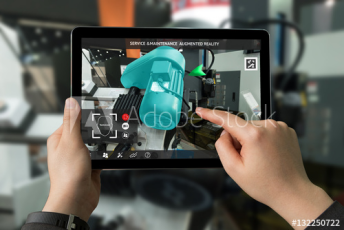 Augmented reality has been applied in many areas of industrial maintenance, production and designing very effectively. Q3 Technologies provides custom AR/VR solutions in all domains to aid the growth of the business. The client wanted a solution for their on-field technicians to be better equipped with correct instructions and error-free installations. A solution that is easily understandable and where they can relate it to the machines on-field. The client was looking for the solution to reduce their maintenance & support cost and provide a better customer experience. They wanted to remove the involvement of remote maintenance support through technology. Q3 Technologies provided a complete augmented reality solution for maintenance and support of the machine parts. The AR app was developed on the Unity Platform using the Vuforia SDK. The solution was provided for Android and IOS platforms where the user can point their camera device to the machine and get list of procedures with detailed instructions. Markerless tracking: As the solution was meant for machines in different places and conditions, markerless tracking with 3D models based on photographs was used to accurately identify the correct parts. Checklists & Procedure steps: The application provided a series of checklists and steps to perform, audit and inspect. This data was also used for getting performance analytics and metrics of technician. Interactive guides: Paper based manuals were augmented with rich media like videos with 2D and 3D animations for better understanding and training of the staff.